(June 12, 2005) -- The U.S. Geological Survey raised its southern CA forecast earthquake hazard map following Sunday morning's temblor (8:41:46 a.m., 5.6 magnitude, near Anza west of Palm Springs), slightly affecting the LB area with the greatest increase reflected in southern OC. The USGS posts 24-hour real time maps (link below)...and LBReport.com managed to capture their map before Sunday morning's quake...allowing for a comparison with the USGS "after" map on Sunday afternoon. 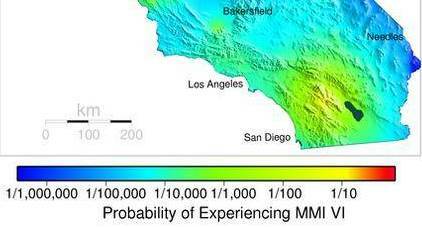 The change indicates a slightly increased probability of shaking in LB with the greatest change in OC and southern OC. The desert area quake was felt by some LBReport.com readers in central and ELB. A Rose Park area reader reported feeling strong, rolling motion. An El Dorado Park resident emailed to report her "whole house just rolled." Another reader near CSULB reported a "long slow rolling quake and all the wind chimes and hanging decor were swinging away." To view real time USGS maps forecasting So. Cal's earthquake hazard in the next 24 hours, click here. It is a time-dependent map giving the probability of strong shaking at any location in California within the next 24-hours. Scientists with the Swiss Seismological Service and the Advanced National Seismic System (ANSS) have collaborated to develop techniques that quantify the increased likelihood of future earthquake shaking from earthquake clusters in California. In this system, the probability of strong earthquake shaking (with a Modified Mercalli Intensity of VI or greater) in the next 24 hours is calculated and updated every hour. The system considers all the earthquakes, large and small, that are recorded by the California Integrated Seismic Network (CISN), the California element of the Advanced National Seismic System. For each event, the probability that it will be followed by an earthquake large enough to cause strong shaking is calculated from the known behavior of aftershocks and the possible shaking pattern predicted from historic patterns. These probabilities apply both to aftershocks smaller than the first event and to the possibility that the "aftershock" will be larger than the first event which will then become a foreshock. The map is showing the probability of a certain type of earthquake shaking - Modified Mercalli Intensity VI, or the level of shaking that throws objects off shelves. This is not magnitude, which would describe the size of the earthquake itself. 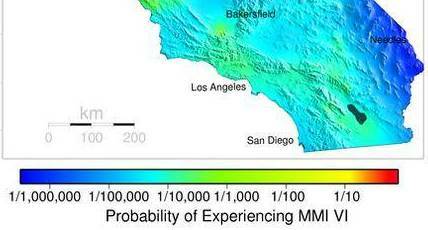 MMI VI is the shaking directly above a M4.5, 20 miles from a M6, or 50 miles from a M7. Like radioactive decay on a Geiger counter, aftershocks occur at a defined rate but the time of any one is random. We can therefore never say when the next aftershock will happen but we can determine a probability that an aftershock will occur during a given interval of time. Just after a very big earthquake, the probability of a strong aftershock might be 8 in 10 (almost certain). However, after a M3 event, it is very unlikely, perhaps 1 in 5,000. Even though this is very low, it is higher than it would be if the M3 had not occurred.